When do we receve the rewards of the leaderboard? It ended no? You are joking. When you get your reward and where have you found it? Get your pitchforks and torches and let us march to the next office of WG. RIOT, NOW!!! Birthdays, Christmas, Blitz Events. I'am old and my heart is weak. I can' wait. I played 2 battles - one in FCM 50t and one in IS-2Sh then closed the game. 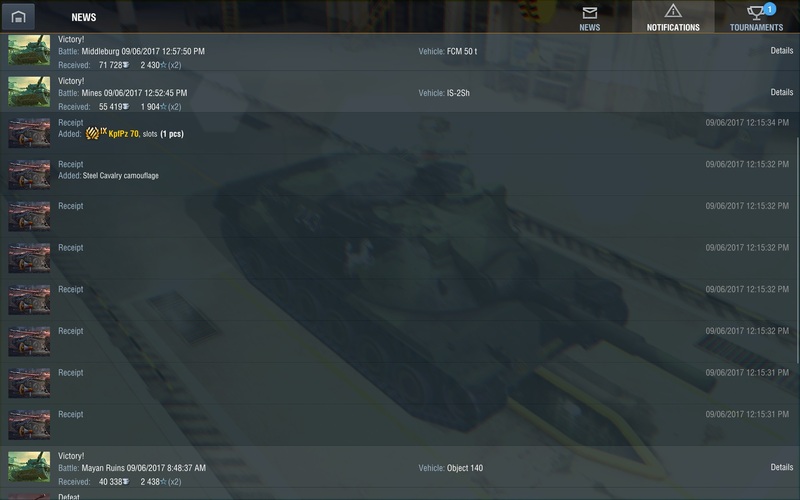 When I logged in 30 min later the KpfPz 70 was there ... and this funny Receipts ... which are there no more (in notifications). Seconds I did get my rewards for the event and you know it's ended when I get it ? Interesting how your Jagdtiger Average Damage rose by almost a 1000 points during the event. You must have had a sudden jump in skill, impressive. @Everyone: WG made it clear in the news the rewards would be given at 12 GMT, not at midnight. Don't panic, read the news. You should've gotten it by now. Edited by superschnitzelkoenig, 06 September 2017 - 04:21 PM. It is simple. There is a nice reward at the end, i played accordingly. After September 6, 12:00 am (GMT), the 1,000 players with the most Combat Sigils will be awarded the enriched Tier IX KpfPz 70 tank with legendary camo, 6 pieces of unlocked equipment, and a slot in the Garage. It says "after", not "at". I'm happy for the top 1,000 but for the rest of us, these crates are a bit pants, no? I've opened half of mine, and there's nothing remotely exciting in them. Feels like a poor reward for the effort. However, thank you WG for my 90k spare parts across 2 accounts. Also, who decided to call them 'charms'? What are they magic or something? Sigils was ok, even if most of us did refer to them as 'seagulls'. I've got my boxes. Nice. I am SO HAPPY that the Rocket-crap is over!! I hated that "Arty on Steroids" so much. It broke the game. If you ever add those game permanently, I might find other entertainment. Players hate arty for a reason and there is no reason to have 10x better arty with auto-aim-guided missiles in the game. The crates for Kpfpz 70 were just ridiculously overpriced vs. the odds and the crates gave just crap otherwise. The T49A was a disaster. It introduced Guided-missile Artillery to the game and broke the game mechanics. NEVER AGAIN! Edited by jylpah, 20 September 2017 - 02:13 AM.